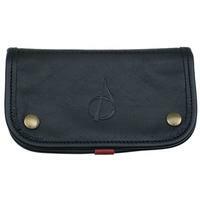 A more spacious counterpart to the slim-lined option, this Claudio Albieri Deluxe tobacco pouch is fashioned from superior Italian leather, and lined with high-grade, stain-resistant surgical rubber to keep your tobacco fresh and moist. The addition of a pocket on the reverse of the outermost flap allows enough space to accommodate a lighter, tamper, and pipe cleaners (or just about anything you'd need to enjoy your pipe when out and about). 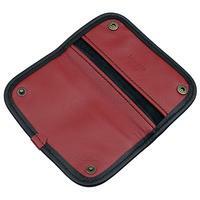 Available in four handsome colors and color combinations, including Black, Tan/Chestnut, Chocolate/Russet, Black/Grey, Russet, and the Black/Red option seen here, these tobacco pouches are an essential accessory for the pipe smoker on-the-go.